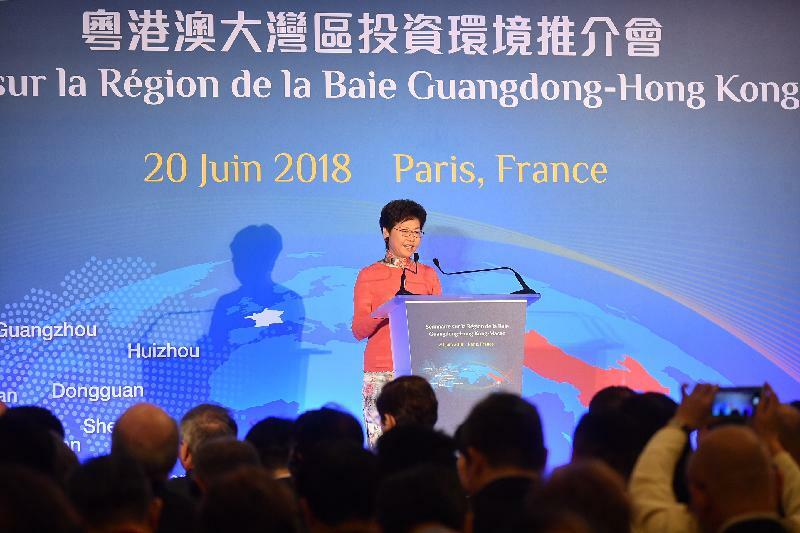 The Chief Executive, Mrs Carrie Lam, yesterday (June 20, Paris time) spoke at seminars on the Belt and Road Initiative and the Guangdong-Hong Kong-Macao Bay Area development to promote the opportunities brought by and the role of Hong Kong in these two major national strategies to different sectors in France. She also met with members of the French National Assembly, and visited a famous university. In the morning, accompanied by the Secretary for Commerce and Economic Development, Mr Edward Yau, and the Secretary for Innovation and Technology, Mr Nicholas W Yang, Mrs Lam toured Rodin Museum which, opened in 1919, is dedicated to the works of French sculptor Auguste Rodin and receives about 700 000 visitors annually. Mrs Lam said that with the completion of facilities such as those in the West Kowloon Cultural District, there will be more art exhibition space in Hong Kong in the future. 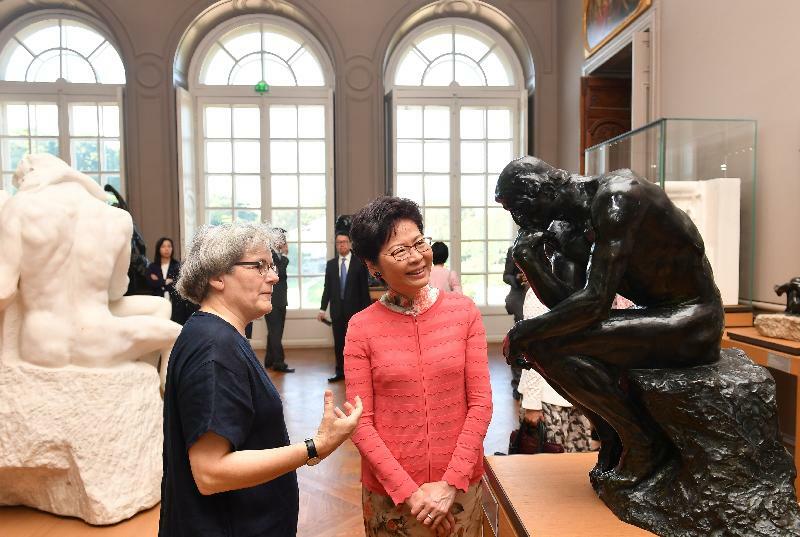 She looked forward to collaborating with Rodin Museum so that members of the public will have the chance to see the collection of the Museum in Hong Kong. Afterwards, Mrs Lam attended the joint promotion seminar on Guangdong-Hong Kong-Macao Bay Area and delivered a keynote speech. The seminar, attended by hundreds of representatives from the French business sector, is co-organised by the governments of Guangdong, Hong Kong and Macao, aiming to highlight the vast opportunities to be brought by the Guangdong-Hong Kong-Macao Bay Area. Mrs Lam briefed the participants on the background of the Bay Area and the favourable conditions for its development. The Vice Governor of Guangdong Province, Mr Ouyang Weimin and the President of the Macao Trade and Investment Promotion Institute, Mr Jackson Chang, also delivered speeches at the seminar. 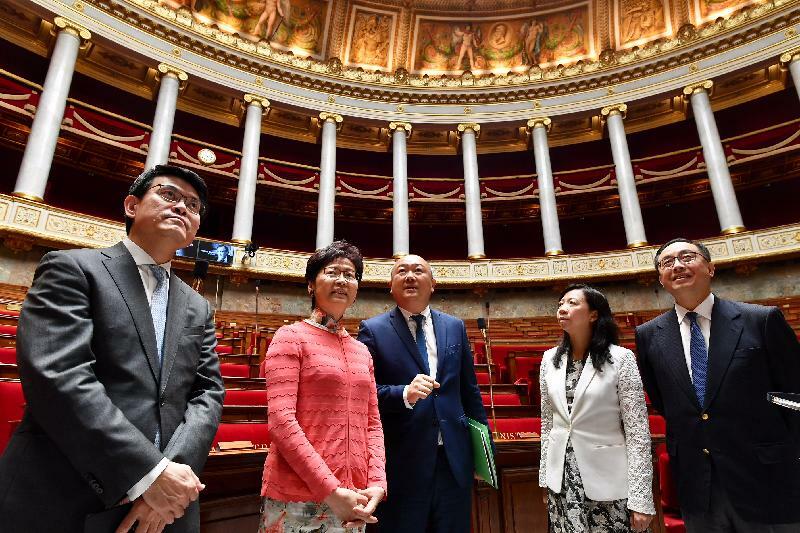 At noon, accompanied by the President of the France-China Friendship Group of the National Assembly, Mr Buon Huong Tan, Mrs Lam and the other officials visited the National Assembly. 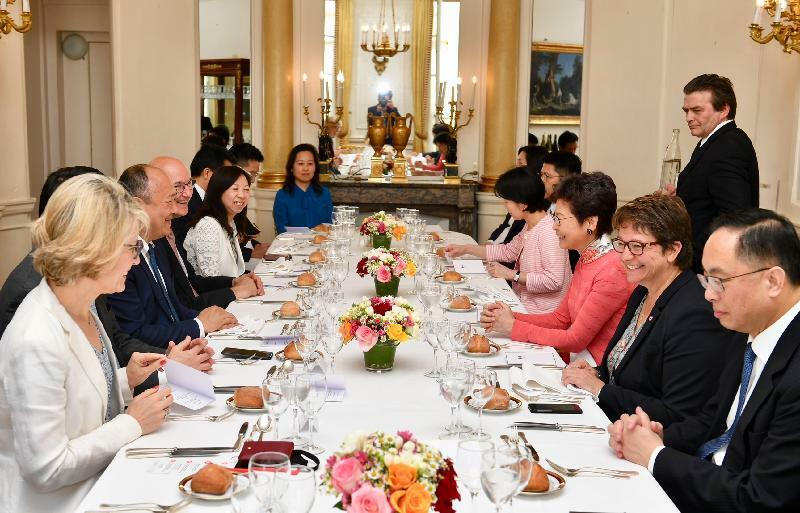 They attended a lunch hosted by Mr Tan, and the Vice President of the National Assembly, Ms Carole Bureau-Bonnard, also attended. Mrs Lam was very impressed by the architectural features and historic decorations of the building which has been housing the National Assembly since the late 18th century. She said she is pleased to know that the Group has a close and good relation with the legislature in Mainland China and has frequent visits to China in recent years. She invited the Group to visit Hong Kong in the near future to learn about the city’s development. 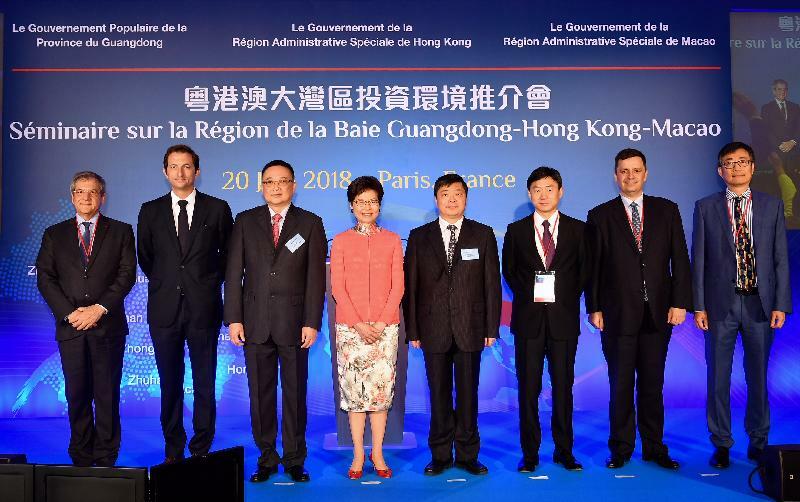 After the lunch, Mrs Lam attended the "France-Hong Kong & Mainland China Economic Forum" co-organised by the Chinese General Chamber of Commerce, Hong Kong, Business France and the China Federation of Industrial Economics, with the Belt and Road Initiative being the theme. She noted in her speech that the Belt and Road Initiative will bring a range of opportunities to Hong Kong and Hong Kong will play an important role in it. She looked forward to co-operating with French enterprises to explore the business opportunities in Belt and Road projects. 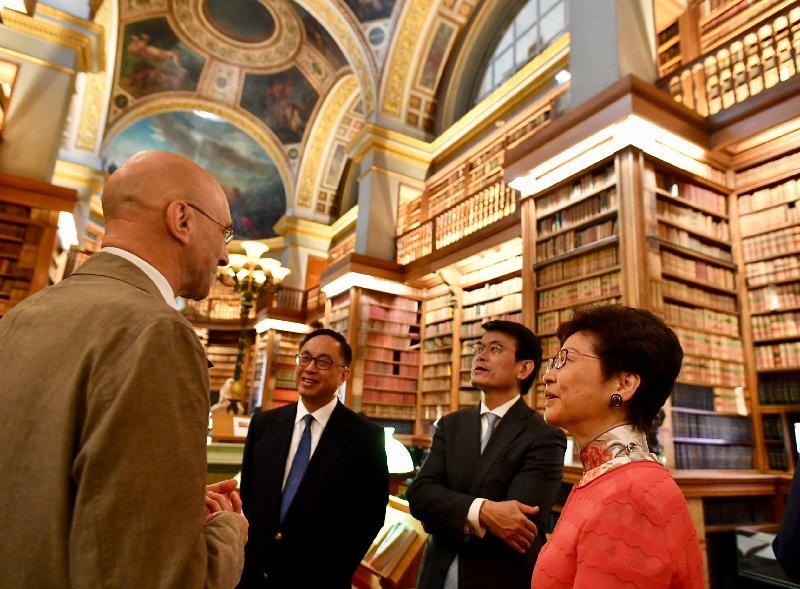 After the forum, Mrs Lam and the other officials visited the Sorbonne University which was formed by merging the University Pierre and Marie Curie, also known as Paris VI, and Paris-Sorbonne University on January 1 this year. The University is widely regarded as one of the top universities in France and in the world. During the visit, Mrs Lam met with the President of Sorbonne University, Professor Jean Chambaz, to learn about the university's latest development. She said that she would like to promote the development of innovation and technology in Hong Kong through the collaboration of the Government, universities, including renowned academic institutions and research organisations overseas, and enterprises. With the Government rolling out measures to attract overseas institutions to come to Hong Kong, she looked forward to having Professor Jean Chambaz in Hong Kong to explore collaboration with the Government and universities in Hong Kong. 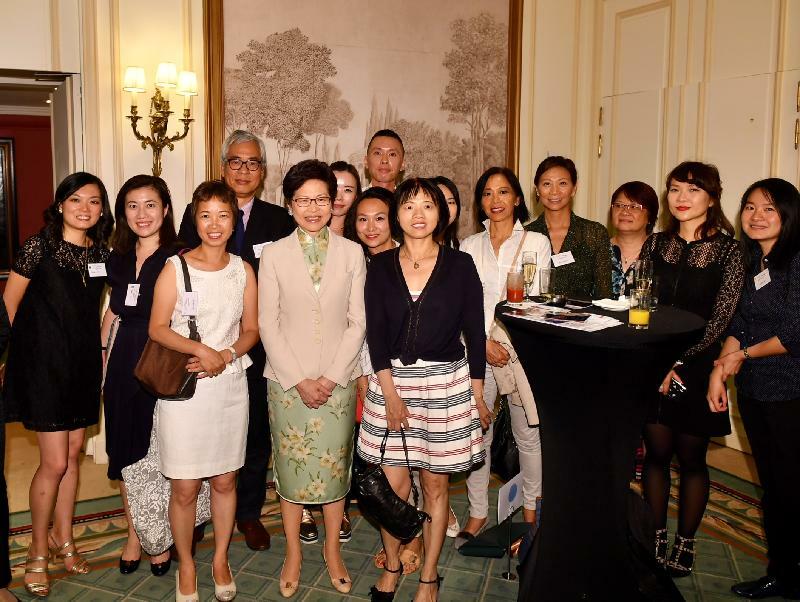 In the evening, Mrs Lam and the other officials met with members of the Hong Kong community in France to learn about their lives. 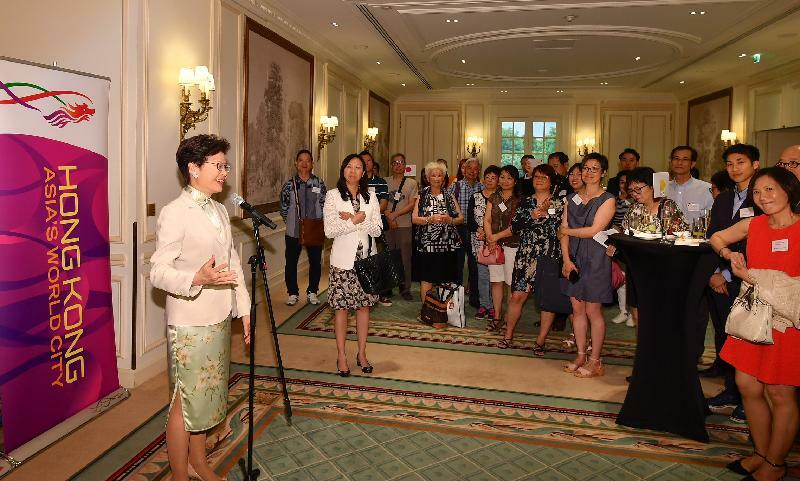 She expressed the hope that the Hong Kong community would continue to play an important role in France and offer better support to Hong Kong’s development. 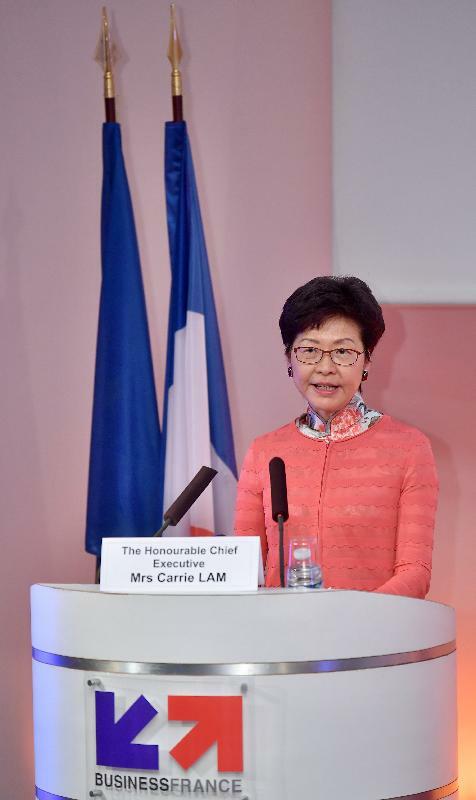 Mrs Lam will continue her visit to Paris today (June 21, Paris time).